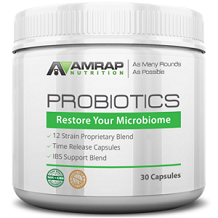 Today we review Amrap Nutrition Probiotics. With over 5 billion live cultures put into a slow release capsule, this product claims to help improve your digestion and overall intestinal health. Combining 12 strains of good bacteria, these capsules should also help to support your Irritable Bowel Syndrome. With only 5 billion CFUs of good bacteria per capsule, that means, if split evenly, there are not a lot of bacteria from any of the 12 strains. Most probiotics need at least 1 billion of each strain to work well. Additionally, the last four ingredients were listed as part of a Proprietary IBS Support Blend, but these ingredients are not known to help stop the pain, cramping, and other symptoms from IBS. Nutrients like ginger, turmeric, and fennel all have anti-inflammatory properties that work in the gut to help ease the bloating and other issues caused by IBS. The manufacturer recommended dose is 1 slow release capsule per day. It is not stated whether this supplement needs to be taken with food or if there is a certain time of day that this capsule works more efficiently. We found no listed side effects or warnings for this supplement. This is slightly concerning, as even the safest supplements have simple warnings like, whether or not it is safe for pregnant women, or that people already taking medications should speak with a doctor before adding this product to their daily regimen. Without these simple warnings, it seems the manufacturer has something to hide. One container of this supplement contains 30 capsules. The manufacturer’s suggested retail price per container is $59.95, but it is currently available for purchase for only $39.95. Free shipping is offered for orders over $49. This price is a bit higher than other similar products, and we were unable to find any other type of discount beyond the free shipping. This manufacturer does offer a 90 day, money back guarantee on all of its products. If you find you are not completely satisfied with this supplement, you can contact the company for a full refund, including shipping costs. They also allow the return of completely empty bottles to ensure you have had the chance to truly give their products a chance to work. There are a few things we liked about Amrap Nutrition Probiotics. The capsules use a slow release technology, allowing the probiotics to reach the intestine, where they are most effective. Also, the manufacturer’s guarantee is very good and even will refund your shipping costs. Unfortunately, we had many concerns regarding this product. With so many strains of good bacteria, but only 5 billion units, there is not enough of each probiotic to be fully effective. 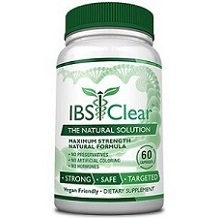 Also, the IBS blend does not include many proven ingredients to actually stop your stomach pain and other symptoms. Next, there were no listed side effects or warnings, which could mean the company has something to hide. Lastly, the price is slightly expensive and there were no available discounts, like buying in bulk. For these reasons, we cannot recommend this supplement to help you ease the symptoms of your IBS.